Last week, I attended an amazing YMCA overnight camp, and had a great time boating, swimming, climbing, and participating in activities like archery. I stayed for 6 fun days, jam-packed with activity, and made some really great friends. Though I will always remember this camp as an outstanding experience, there was one thing that was not nearly as fantastic in my mind- the food. Picture this: before a long day of sports and games, you are ready for breakfast, and excited for the activities to come. You and your friends sit down for breakfast, only to find pre-made frozen waffles and sausage from an unknown source. Next to you there is the “healthy option,” artificially sweetened and colored yogurt and granola with one fruit. I don’t know about you, but I believe that’s not very good fuel for an active day of sports. While the daily vegetarian option was better than I thought (quesadillas and soup, etc. ), I still had to wonder, “Where did this come from?” Luckily, before camp started I picked up some of my own snacks to share with my cabin! This was great because if there wasn’t many healthy options at meals, I could supplement some fruits or veggies with a snack. This year I brought along some fruit and nut bars, whole grain popcorn, dried fruit leather, and some Annie’s bunnies (definitely a treat, but this was a great thing to share.) If your camp allows campers to bring their own food, I would highly suggest it! Otherwise, my advice would be to try and choose mostly food that you know is real food (fruits and veggies, hard boiled eggs, cheese etc.) and do the best you can. However, overnight camp is about having fun and making new friends, not worrying about the food you are eating. So, on that note, this camp was amazing and I made some awesome new friends! Over the course of one week, I tried several types of boating, climbing, team building games, sports, and crafts. We did so much in one week, and I’m glad I had this opportunity. I came home tired after all the fun, and I can’t wait to come back next year! 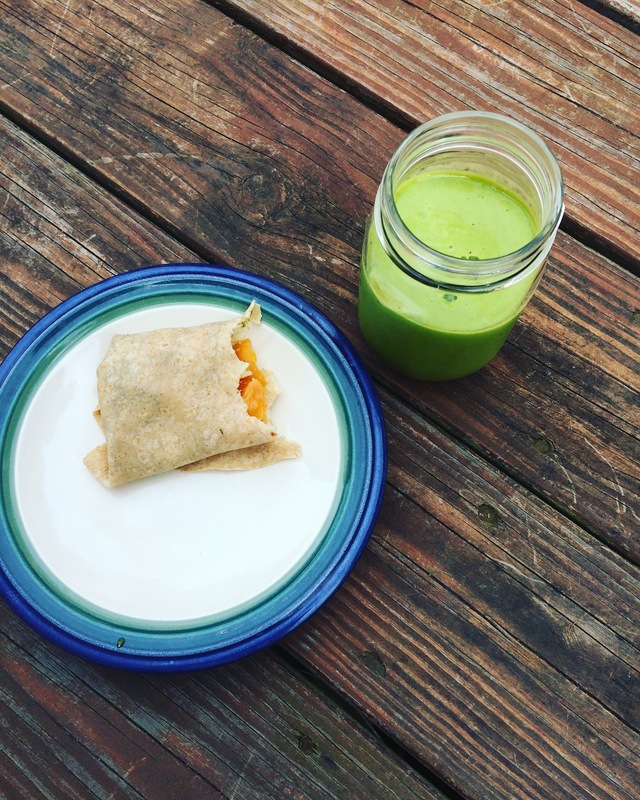 Down below is a picture of the lunch I made after camp- a green smoothie (made with mango, pineapple, plain yogurt, spinach, and water) and a whole wheat tortilla with sun gold cherry tomatoes from our garden, whole milk mozzarella, and some pesto. Yum!